Strikingly modern, elegant and versatile – it’s hardly surprising that glass has always held such appeal for designers, furniture makers and architects. Its design heritage is remarkable, ranging as it does from Victorian stained windows to Art Deco Lalique ornaments and lamps in the 1930s, right through to the work of contemporary designers who are using state - of - the - art Pilkington glass in modern furniture and glass roofs. Now, as a result of new technological developments and innovative designs combined with glass’s most obvious property – its transparency or translucency which allow it to make any room feel lighter and more spacious – the boundaries are increasingly being pushed with this traditional and yet excitingly new material. Yorkshire-born glass artist Jeff Bell specialises in the design and manufacture of unique cast glass sculpture, furniture and architectural elements to clients throughout the world. 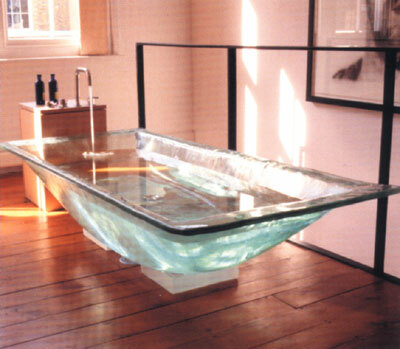 His baths, for instance, are made entirely from glass and shimmer with light when filled with water. Bell also makes glass screens which are backlit for a stunning effect. His tables, this time lit internally, have a ghostly yet intense luminosity. Chandeliers, traditionally period pieces, become striking modern sculptures in Bell’s hands. Pilkington glass is increasingly being used for furniture and accessories including walls and doors which can divide particular areas and insulate rooms but still give a feeling of light and space. Pilkington Activ™ Blue would have been used as the outer pane of the IGU (insulating glass unit) which benefits from both self- cleaning and solar controlled properties. The inner pane of the insulating glass unit benefits from a low emissivity glass, which helps increase the thermal insulation of the room, helping to create an environment which can be used all year round, even on the coldest winter day. “Even when the weather is not good it works well. Our client says that she loves to sit in her new extension under her glass roof with a cup of coffee and listen to the soft patter of rain coming down around her,” says Burden. With their flair for interior design, the Italians are also using Pilkington glass and glass from other manufacturers in new and exciting ways. Whereas the contours of Jeff Bell’s glass bathtub are smooth and rounded, designer Piero Lissoni has created a severe, angular version for kitchen and bathroom brand Boffi. Glas Italia specialise in glass furniture, ranging from shelving units where the objects placed in them almost seem to hover mid-air to a chaise longue made from sheets of smoked glass. 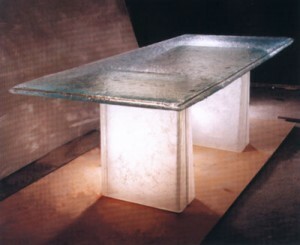 Tables are either ghostly and ethereal with their plain crystal tops or fun and funky when created with glass that is brightly coloured. Flexible and versatile, here, as elsewhere, glass has the power to surprise and inspire.